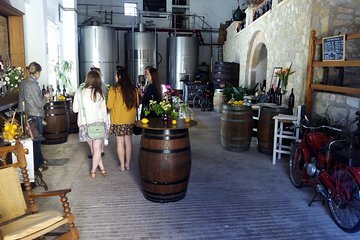 Run your palate by some of Mallorca’s home made wines on a 2-hour experience from Palma de Mallorca, with a local guide. Traveling by comfortable, air-conditioned coach, journey to a traditional wine estate tucked near the rocky Serra de Tramuntana mountains. Meet your friendly guide specialized in Wine, and tour the production areas and cellars to learn each step of the winemaking process, from vine cultivation to bottling. Finish with a tasting of three or more varietals, each balanced with a delicious local snack such as ‘quelis’ (crackers) and olive oil and olives. This visits a rural winery for wine tastings and includes hotel transfers, avoiding any worries about driving. 3 or more wine tastings with snacks and more. Departures on weekends morning and afternoon. However departure time can be arranged by contacting the supplier before departure.